This is my first homemade superheterodyne radio, and the first radio I've built that works! The circuit is based on an AA5 (All American 5) and WA2ISE's modifications. Most of the parts were strapped off an old AA5 Motorola radio. Some other parts came out of my junk pile. Below is the schematic diagram of my radio. The B+ power supply design is shown further down this page. The tube filaments ran in series from a 25V transformer. If the oscillator coil does not oscillate, then reverse the connections on one of the coils. Some oscillator coils may have only four terminals (two coils), so use a 56pF capacitor from the grid of the 6111 and the oscillator coil (see schematic below). For the power output tube, a 5902 is recommended for more power. I didn't have that tube so I used a 5702 instead. Also make sure the speaker is a reasonable size so it doesn't draw too much power, or the output tube may get stressed. 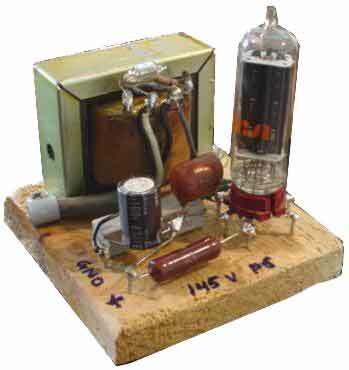 This 145VDC B+ supply was built for the subminiature tube radio above. Below is the schematic of the power supply. This power supply is very similar to the power supply in AA5 (All American 5) radios. The 35W4 is a half-wave rectifier providing half-wave DC, the transformer is only for filament power. The 30 ohm resistor limits the current and the capacitors are for filtering. The 4.7K is a load resistor, which loads down the power supply to about 145VDC and also discharges the filter capacitor when the power supply is not in use. The neon indicator (Ne2) lights up when the power supply is on. WARNING: This power supply is NOT isolated, thus the output can be HOT. For safety purposes, an isolation transformer is recommended.